Recently, I had the pleasure of working on this stunning home design by Distinct Innovations (www.distinctinnovations.com.au). 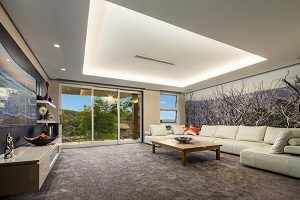 Inspired Spaces were responsible for all the interiors finishes and furniture of this contemporary house in Mount Riverview in the Lower Blue Mountains. All furniture bar the lounge was custom designed as were the soft furnishings for the master bedroom. 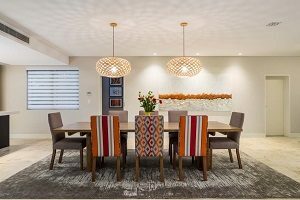 The rug was designed to complement the dining area and to make the beautiful recycled timber table shine. The customisation of the chairs even took into account the small stature of one of the clients and ensured that the seating enabled her feet to actually touch the floor. The commissioned art work complemented and tied the colour scheme together. The client’s grandchildren’s paintings were framed to create a personal touch to the space. The one-off feature wallpaper in the lounge room was created from one of the client’s own photographs of a favourite holiday place, again making it a personal statement. As with all new homes, the final decoration is evolving as new experiences are integrated into the space. Ever now, we cannot wait to see our next step in the process come to fruition. A family tree of photos along the top floor hall. It is a compilation of over 80 photos of their family, starting with the client’s parents, right through to their own grandchildren, gives a touching and meaningful purpose to an otherwise long and boring hall. When I look at the house, I can’t help but being reminded of Frank Lloyd Wright’s Waterfall house with its organic architectural style. Embracing the surrounding nature, the colour scheme matches the earthy tones that are so distinctive for the Lower Blue Mountains. The owners even incorporated an existing rock at the entry into the house design. If you want to know how we can help you with designing and decorating your home, just contact us. Suppliers were: More than Curtains, Twist Lifestyle, Wallcandy Art & Paint, Botany Bay Design Solutions.